There's a shortcut connecting the shores of Northern Kentucky and Cincinnati and it's the only one of it's kind in the area. That shortcut is the Anderson Ferry. 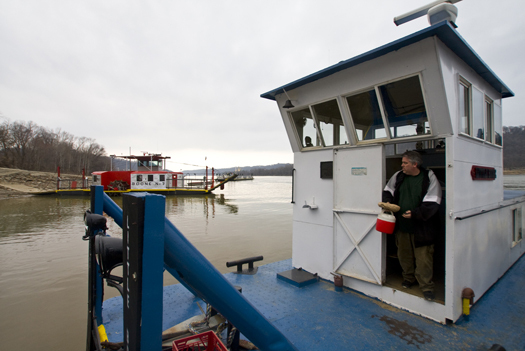 Operating three boats, the crew of the Anderson Ferry shuttles passengers from Anderson Ferry Rd., six miles west of downtown Cincinnati, across the Ohio River to Constance, KY, just North of the Cincinnati/Northern Kentucky International Airport (CVG) or vice-versa. I can vaguely remember taking the ferry when I was really young and to be honest, had forgotten about it's existence till I stumbled upon the website of Dennis Camp, a great photographer who had been documenting the Ferry for some time. I still needed a subject to photograph for my final assignment at Ohio University so I contacted the ferry's owner, Paul Anderson, and made the necessary arrangements. - The Ferry on the Kentucky Shore. I was able to photograph the ferry on two separate occasions, each time spending about four hours with the crew, crossing the Ohio River many times. 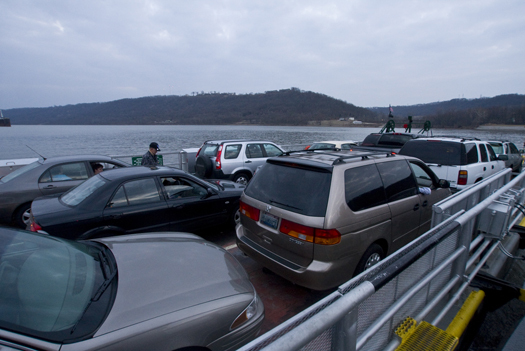 The Anderson Ferry is unique in that it is the only ferry currently serving the Cincinnati area. The ferry has existed since 1817 and is a landmark on the National Register of Historic Places. Occasionally bridges have been proposed in the location of the ferry and the recent economic woes and fuel prices have had an affect on ferry customers and operating costs, but Mr. Anderson and his team continue to offer a very unique and convenient service. - Don Phelps pilots the "Boone No. 7." The "No. 7" is the oldest boat in the ferry fleet, still using wooden paddle wheels and originally running on steam. The two steering controls seen here were originally used in a Cincinnati streetcar. If you want to avoid I-275 or I-75 the ferry provides close access to downtown Cincinnati, just six miles to the west of the city. The Kentucky side is just North of the Cincinnati/Northern Kentucky International Airport (CVG). "...if I time it just right, my personal best is about 20 minutes." says Brian Malloy, a resident of Northern Kentucky who often uses the ferry to commute to Cincinnati with his daughter Maire Shannon. The crew of the ferry operates three boats: The Deborah A (named after owner Paul Anderson's wife), the Boone No. 7 and the the Boone No. 8. The busiest time for the ferry is during rush hour from 4:30 until about 6:00 when the crew will operate two ferry boats simultaneously. - A loaded boat during rush hour. During my visits to the ferry I had the opportunity to meet many crew members, each with their own unique story. Crew members like Don Phelps; who was inspired to become a pilot after reading Siddhartha, John James; a proud military veteran who has lived on the ferry property and worked there on and off since 1966, Virgil Souder; a deckhand and former captain who can no longer pilot the boats due to his deteriorating eye site and Paul Anderson; while not related to the original Anderson Ferry operators, he continues to run the operation today. Audio interviews with the crew and more photographs can be seen in this interactive slideshow: EDIT: After the server crash in 2010, the slideshow was lost. Not that it matters, most mobile phones don't run flash anyways. The Ferry not only provides you with a shortcut and alternative to the interstates, but the opportunity to experience something not commonly seen on American rivers today. Despite the changing times, the Anderson Ferry continues onward into the future. If you ever get the chance, take the ferry and support a great local business! 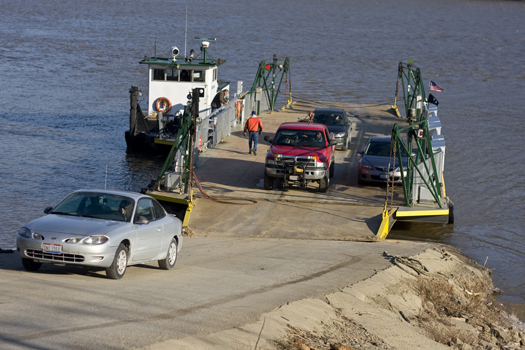 Whether your coming to and from the airport, commuting to your job or just looking for something interesting to do, take the ferry and get out of your car for a few minutes while enjoying a nice relaxing ride on the Ohio River. Thanks to Paul Anderson, Don Phelps, John James, Virgil Souder, Don, Brian and Mairie Shannon Malloy and everyone else I met while documenting the ferry! The ferry still operates daily and remains a local icon. Virgil Souder, mentioned in this article as a deckhand who had worked at the ferry on and off since 1966, perished in the Ohio River in December 2013.